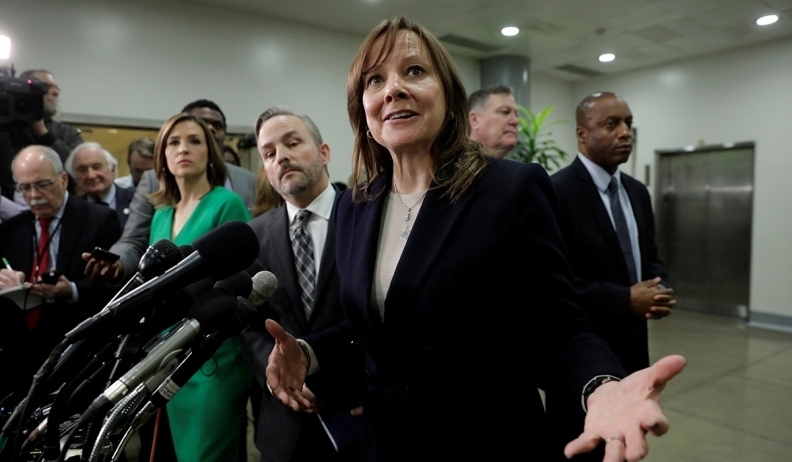 GM CEO Mary Barra speaks to the press after meeting with the Michigan congressional delegation on Capitol Hill on back in December. Canadian politicians now want to grill her over the automaker's decision to close a plant in Oshawa, Ont. Federal MPs want to question General Motors CEO Mary Barra about the automaker’s future in Canada. Ontario New Democratic Party MP Brian Masse filed the motion, which was passed by the all-party committee. General Motors said in November it will no longer allot product to its Oshawa, Ont., assembly plant beyond 2019. It means about 2,600hourly workers will be out of a job. The automaker will stop the shuttle program that sees unfinished outgoing models of the GMC Sierra and Chevrolet Silverado shipped to Oshawa from Indiana for completion. It will also no longer make the Chevrolet Impala and Cadillac XTS, both of which are currently assembled in Oshawa. The automaker insists no jobs are being created in Mexico. And, there will be job losses, too, as part of GM’s global restructuring. Barra isn’t compelled by law to appear, however. GM Canada would not say whether Barra will appear before the committee. Barra already met with U.S. lawmakers in December and faced some tough question from Congress on Capitol Hill. Sen. Gary Peters, a Michigan Democrat, questioned why GM was launching production of its new Chevrolet Blazer crossover in Mexico as it was cutting production in the United States and said the company needs to move the vehicle to the U.S.
"We did get answers as to some of the decisions that they made. But I think they need to revisit that thought process and understand the importance of making [vehicles] locally," Peters said after the meetings. Barra told reporters after the meetings it was "important for General Motors to make necessary but incredibly difficult changes." Unifor, the union that represents about 2,600 workers in Oshawa, wants the Blazer assembled in Canada. The Standing Committee on Industry, Science and Technology is a federal, all-party committee that studies and reports on legislation, the activities and spending of Industry Canada and its portfolio members. Automakers, including General Motors, received billions of dollars from taxpayers when the federal government bailed them out of financial trouble during the Great Recession in 2009. The committee also keeps tabs on Canada’s industry and technology capabilities, investment, trade and more. Another 23,000 people work for GM dealerships across Canada, the automaker says. “Automotive is transforming, and so are we, so we will be here for the next 100 years,” the automaker says in reference to the 100-year-old Oshawa plant.